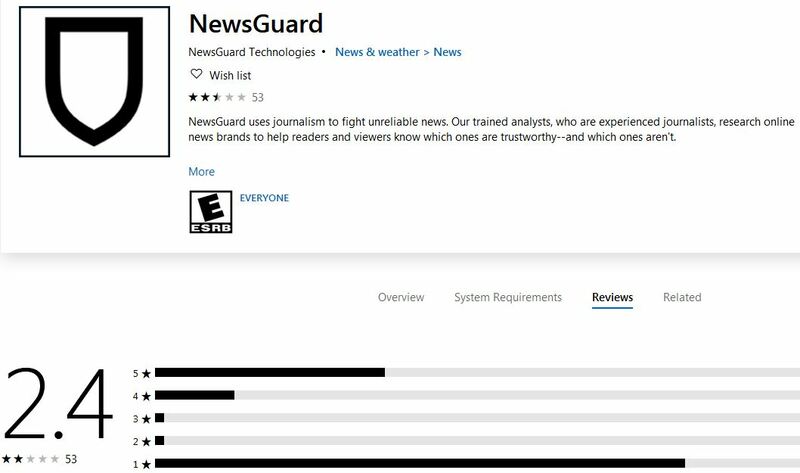 As of this writing, the extension has been given a paltry rating of 2.4 out of a possible five stars by the 53 users who have rated it on Microsoft so far. Please note that this is the number of people who have rated the extension at the time of this writing. Many of the 40 users who entered comments seemed to have been hopeful the extension would do what it purports to do, but were turned off by what they saw as the overt liberal bias shown by the reviews. Purports to be an unbiased journalistic oversight app but misses the mark. The reality is it heavily favors left leaning news sources and discredits right leaning news sources. If it advertised itself as a certifier of leftist media, I’d give it 5 stars. But it doesn’t–1 star. Excellent evidence — Buzzfeed. This is a news outlet that has tarnished its reputation publishing false reports on the Mueller investigation–the Mueller team came out and denied the Buzzfeed report as inaccurate. Guess what the NewsGuard’s rating of Buzzfeed was? Full marks! Trustworthy! The app is a neat concept but poorly executed. So if you’re in the mood for a leftist echo chamber pointing you in the direction of more ideologically homogenous news media, this is the app for you. Media Matters, TMZ, Eonline, Buzzfeed, Vox and…worst of all…Southern Poverty Law Center all get a green. NYTimes, Wapo, HuffPo, MSNBC all get green. Drudge? Red (of course…which is hilarious because it only includes links to other news outlets.) The Blaze, red (even though it obviously says it’s intended to cover what liberal news leaves out…that qualifies as fake, according to this). Anyone who has ever produced anything in writing, picture, video, online…whatever…knows that effort is biased. If for no other reason than they CHOSE to do it, vs not doing it. All humans are biased, but this app only blesses left bias. I’m fine with sites have a slant, so long as it’s obvious. The major media purport to be fair and honest, and they’re >90% left biased. Try to show someone else’s viewpoint and you’re labeled fake. Really bad attempt at fixing a problem…and since when do we censor news? Who gets to be arbiter? Who fact checks the fact checkers? Just show more honesty. Absolute garbage! After the blatant lies of Buzzfeednews that website still gets 9/9 green stars! While a more balanced outlet like Fox gets 6/9? Let’s take CNN, the penultimate standard for fake news – 9/9 green stars even if they were caught multiple times fabricating and misreporting facts! Let’s take a very independent news outlet DemocracyNow.org Gets 7/9 where one red flag is regularly corrects errors – WOW, CNN makes more errors in a day than any other news source. Townhall gets a red for deceptive headlights – HAHAHA and CNN’s headlines are not deceptive or even overly biased? OMG, It’s so true – you can only rely on your own research and not on ANY outlet ever – that’s why the internet was made – LOOK for first hand videos and accounts and only then do believe what the news outlets tell you! What a piece of crap. They pretend to provide a flag to “fake news” but in the process label Conservative new as fake. What a bunch of BS. This really pisses me off. DrudgeReport is an aggregation services and rarely has unique content but is label “fake news”. Now I hear that MS is going to include it in Edge as default. What a cluster [email protected]#k of manipulation. I’m an Independent. So I liked the idea of this add-on. I checked out some sites to start. First, I went to TheBlaze, and it was flagged red. I read why in its “nutrition label” (frequent corrections, lack of transparency) and I thought, “Okay, that makes sense.” Next, I checked out Buzzfeed, and it is ALL GREEN! This is a site that literally just published fake news three days prior that has been refuted since. At the least one of the checkmarks should be red and it not be ALL green. Finally, I went to HuffingtonPost, which I’d say is about the other end of the spectrum as TheBlaze. Again, marked as Green, but with one red negative in its list. In the end, I don’t feel like I can trust this add-on, as it seems to be inherently biased based off some cursory examples I looked at. Hopefully it refines itself a bit over time. As we reported here, Microsoft, one of the companies that make up what this writer now calls the “Silicon Valley Axis of Evil” that is hell-bent on silencing and censoring conservative voices online, will be including the extension in the Edge browser by default. Our headline does not say “military action”; it says “war” — a word cited by others on at least a dozen occasions. “The beltway establishment figures who started NewsGuard claim to be non-partisan. But the logic of their system leads towards the demonetization of pro-Trump and populist conservative media, as well as the few anti-establishment sites of the left that are also on the extension’s blacklist, like the Daily Kos,” Bokhari further said. In other words, NewsGuard is nothing more than an Orwellian effort to enact Soviet-style control over online speech. And it seems that those who have rated it so far have seen through the hype. In the interest of full disclosure, NewsGuard has also given this site a red badge (of course, we’re conservative) and claimed that it attempted to reach us. As the owner of the site and the person who would have seen any such correspondence, I call “BS” since I have never heard from anyone at NewsGuard. On the up side, however, we tend to believe that the red NewsGuard rating is something of a badge of honor, proof of our conservative bona fides.